Home Case Studies Dynamic Compaction Case Studies Wakefern Foods Corp. Owner - Wakefern Foods Corp. The site of an approximate 800,000 square foot building was underlain by old fill soils that were also contaminated. The fill soils were in turn underlain by a layer of soft silt and clay in portions of the building area, at depths generally in excess of 10 feet. Excavation and replacement of the fill soils was not possible due to the environmental contamination of the fill. Deep foundations were a possibility, however, the cost of such a system was considered cost-prohibitive. The geotechnical engineers, PS&S, recommended dynamic compaction and surcharging as an economic alternative to deep foundations. TerraSystems was awarded the contract for performing the dynamic compaction. 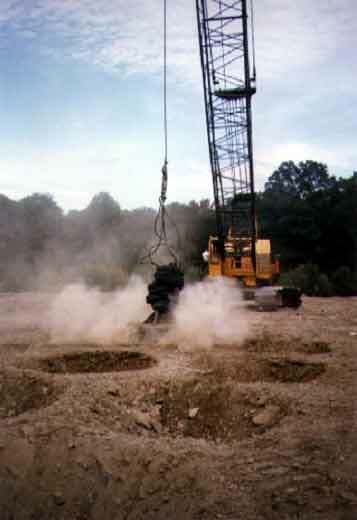 Fourteen ton weights with a base contact pressure of approximately 550 psf were dropped from a height of 50 feet to compact the fill soils. A low contact pressure was used to limit weight penetration, but still achieve compaction. Following treatment by dynamic compaction, a surcharge embankment of approximately 15 feet high was placed in those portions of the building area underlain by soft clay to consolidate the clay.